Canadian biochemist Michael Smith was born and raised in England, but came to Canada to conduct post-doctoral work under Nobel laureate H. Gobind Khorana and rarely left. He became a Canadian citizen in 1964, and developed a new technique in molecular biology, called oligonucleotide-based site-directed mutagenesis, in 1977. His work allowed scientists to remove and insert single nucleotides, alter the DNA sequence of any gene, insert and track designed mutations, and analyze the function of each amino acid. Remarkably, the report of his group's finding was held for months by a prominent scientific journal before being rejected as "a technological development of no general interest". Resubmitted to a different journal, his paper was published toward the end of 1978, more than a year after the work had been completed, and has had major applications in medical research of Alzheimer disease, cystic fibrosis, hemophilia, and sickle-cell disease, among other benefits. 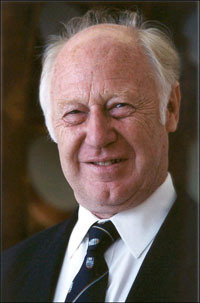 Smith won the Nobel Prize for Chemistry in 1993, and donated the cash honorarium, some half a million Canadian dollars, to scientific research. He passed away in 2000.